This has officially become a Fail arc. It's not a Fail arc because the episodes are bad or the plot is going nowhere or anything like that. It's a Fail arc because every episode involves the good guys trying to do something and failing. 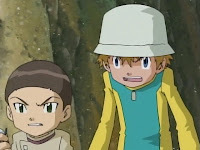 Even a surprise appearance by MagnaAngemon, which breaks rules previously made up on the spot, can't help these guys. It's the second most infamous Fail arc in the franchise, behind the Royal Knights debacle in Frontier, and it's getting to be a bit sad. Granted, even though they aren't the reason for calling it a Fail arc, the episodes are still pretty bad and the plot is pretty much going nowhere. This is the third episode where we've seen a destiny stone destroyed and the third different thing we've seen happen as a result. First it was the dark twister appearing to engulf the whole world, then it was the parade of bad guys temporarily materializing in Kyoto, and now it's Azulongmon trapped in a crystal until Link can beat the boss in Turtle Rock. Even though all reactions are technically correct, the inconsistency is insane. Even more troubling is that this third reaction is coming up just after we're getting some explanations for the first two. Destroying a destiny stone distorts the Digital World, which makes the parallel world not so parallel anymore and running up against the real world... and whatever other worlds are out there like the Dark Ocean. Too much of this sends all the worlds into a spiral and inevitable nothingness. Everybody got that? Remember when the older kids said they gave up the power to go Ultimate? Apparently if you get too close to the destiny stone and want it bad enough, it's enough to negate that and summon MagnaAngemon. This is technically allowable: these destiny stones are clearly strange and powerful things and last episode's “subconscious desires” theory plays a part as well. Still, if they're going to do something insane like create just the right circumstances to allow a freak Ultimate evolution, you'd think they'd do more with it. MagnaAngemon holds his own against BlackWargreymon, but the stone's still destroyed and that means he loses. He gets nothing. Good day sir. It seemed to serve only as a dramatic sting to an episode which seemed to be about TK being a complicated man. No one understands him, not even his woman. His future DNA partner Cody sure as hell doesn't, and the random switching between Happy TK and Angry TK confuses him more. Cody's particularly bothered by Angry TK's willingness to destroy BlackWargreymon even after Gabumon explains that he somehow has a heart, and Cody's inability to get a good beat on TK is jeopardizing their impending merger. It's hard to tell whether TK's bout of schizophrenia is another case of an episode putting an extreme spotlight on a character trait or TK got sick of playing mind games with Davis and decided to start screwing with Cody now. At the end, TK says he doesn't actually hate the powers of darkness, which is a flat-out lie that confuses Cody even further. So I'm leaning towards the latter. Kari and TK seem to create this vivid explanation of parallel worlds using some sort of graphic design/animation program. It's pretty impressive. Can you do that with Photoshop? Funny how Izzy seems to sense an explanation going on and shows up at that exact moment. It's just to give them a convenient way to track BlackWargreymon, but it's a very “Inez from Nadesico” moment. The dub script in this episode does a piss poor job explaining what everybody is doing. 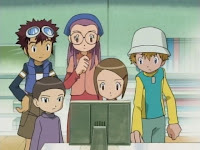 It glances over an e-mail Kari receives (it's from Ken), it doesn't talk about why they all split up after crossing the bridge (to look for the destiny stone), and it doesn't explain why everybody but Cody and TK fly off once Gabumon tells them where the stone is (because Armadillomon can't fly and TK's keeping him company to screw with him some more). 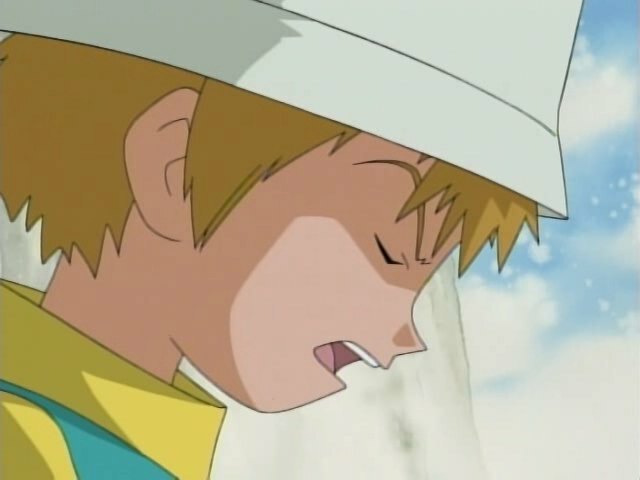 On top of all that, Angry TK's voice acting is still atrocious. His big scene in episode 19 was clearly an exception to what has been a sub-par performance all season. Anyone notice that Silphymon really packs a punch? Paildramon didn't seem to phase BlackWargreymon much, but Silphymon's Static Force attack seemed to actually do some damage. In the dub, the Davis-catching-Yolei scene was simply a cute character moment and minor pairing fuel. Originally it was a joke about the potential for pairing fuel as Miyako is a little too bashful about thanking him and Daisuke is all “WTF, girl?” about it. Points to the Japanese script this time. To be fair to Frontier, their "fail arc" at least had progress. Yeah, it took way too long to resolve, but the kids clearly got better at fighting the Royal Knights as time went on, and we got that awesome Gotsumon who fought alongside Koji for a little bit. That's an improvement over this arc, I'd say- and they didn't attempt to spice things up like they did with TK's Marty Stu powers here! A lot of people misinterpret the digivolution to Ultimate. True, the digimon lost their power to digivolve to Ultimate, but that was because they lost the crests to the Digimon Sovereigns. This didn't mean they lost the potential to digivolve to Ultimate, they merely lost the power that sourced that digivolution. 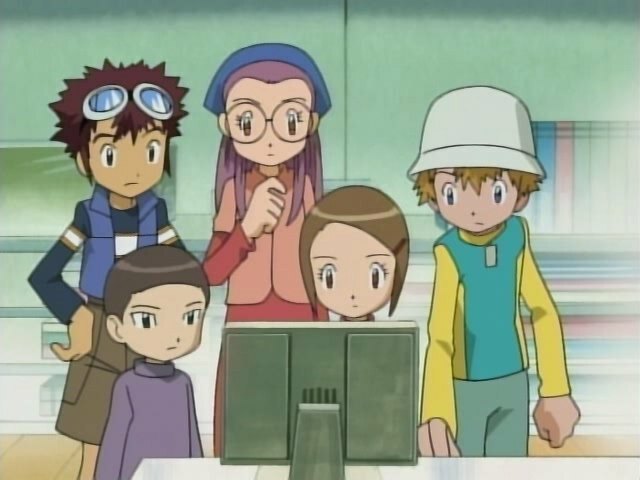 In this episode, the destiny stone acts as the power to fuel Angemon's digivolution to Magnaangemon. I think it goes without saying that while Blackwargreymon tosses around Paildramon and even Silphymon, he acknowledges Magnaangemon's strength as almost equal to his own. Angemon and Magnaangemon are effective against dark digimon, but not digimon from control spires (as seen while battling okuwagamon or whatever). But! Blackwargreymon still says that Magnaangemon is very strong (stronger than Paildramon and Silphymon) even though his power isn't super effective against Blackwargreymon since he is made of control spires. This just reaffirms that Angemon/Magnaangemon are awesome and should have had more to do with the story. Come on, you've got to give Erholtz a break here. He's got a pretty good emotional moment in this ep.